As someone who leads professional development workshops and classes, I know first hand how hard it is to coordinate a place and a time that meets everyone’s schedules. I don’t usually like to admit defeat, but it seems to be IMPOSSIBLE these days. Therefore, I am extremely grateful that more and more people are archiving their PD sessions for people to attend on their own time table. (I know this saved me in #ETMOOC this winter.) Of course, the drawback is not being able to interact with other participants or ask questions live, but being able to get some great ideas from other educators and leaders in your content field when the house is finally quiet; the laundry is folded and the pajamas are on: priceless! Recently, I discovered a page of webinars hosted by Thinkfinity’s Content Partners and ISTE. The topics vary from mobile devices, digital citizenship and how to use tools – to name a few. The page seems to be updated on a regular basis, too. Perhaps, there’s something there that you have been looking for, but not the time to seek it out. Luckily, for me, an unsuspecting teacher was across the hall and available to hear my sales pitch. Again, timing is everything. She told me that her students were in the middle of animal research, and we decided to give the app a test run by having the students record a fact or two in the form of a Gami. Students also would choose a background for the avatar as well as make some character and style options. The Gami would be saved to the Photos app on the Touches, and then emailed to me for uploading to a wiki/blog. Here are the fruits of our experiment. To help things run smoother during our short amount of time dedicated to this endeavor, students were given a planning sheet to write the facts/script and make notes about what the background would be prior to receiving the iPod Touch. Furthermore, a direction sheet to help guide them step-by-step was utilized as they used the app. The app is pretty intuitive; however, to keep students focused and on track especially with the sharing aspect (since the final files had to be in the correct format for our wiki/blog), the sheet was extremely helpful. The next step is to have students visit the wiki/blog this week to watch and comment. Not only will students have an opportunity to learn a new animal information, but they will be expected to give specific feedback on the presentation. This feedback and the overall experience is setting the students up for our next endeavor: to use the Tellagami app to create a weather forecast. This action will demonstrate their newly acquired knowledge from science class that will be embedded in an overall weather presentation (PowerPoint). Do you have any ideas of where a Gami could aid your students in telling a short story, explaining facts or even making a public service announcement? Three years ago, I wrote my first post about Twitter. If you are looking for a way to keep parents informed in bite-sized portions, Twitter may be a good solution for you as it can integrate nicely into a parent’s handheld lifestyle. Likewise, Twitter can help students make connections in their learning. This post has a great visual K-8 guide as well as an example of how the Twitter policy has been explained at one school. It also starts to examine Twitter as a tool that can really stretch students’ thinking. I really the etiquette section and emphasis on practicing digital citizenship. Still not sure how tweeting really would fit in your classroom or why a teacher would even want to dive into this universe? The Five-Minute Film Festival has some great videos to check out that will hopefully answer a lot of questions and get you thinking about the possibilities. It’s one stop shopping on the subject. A while ago, I wrote a post about how #Comments4Kids can impact the writing process for kids. This is a great way to harness the power of Twitter in your classroom. As adverse as it may be to your own upbringing, this is an example of when it is OK to talk to strangers. It’s a great way to model for students the positive experiences that can be take place on the web. We often focus too much on the negative. The result: people are scared, and good opportunities are missed. That brings me to the recurring theme during my whole #ETMOOC experience: sharing and being connected. Either by letting a parent have a snapshot of their child’s classroom life or having students learn how to engage with a real world audience and practice some important netiquette: Twitter is one way to start building relationships in our digital world. 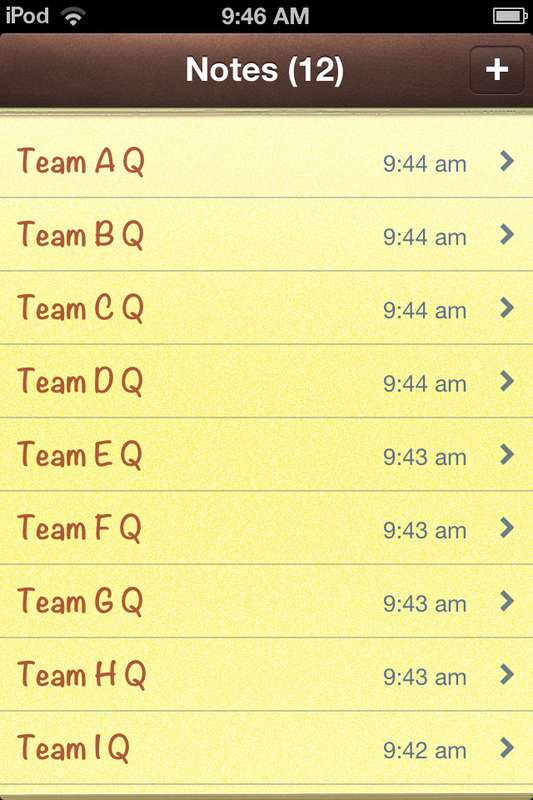 A few months ago, I suggested the idea of using the Scan app on our iPod Touches in a post about QR Codes. In the spirit of sharing and being open, let me tell you what transpired with a QR Code Scavenger Hunt experience in a grade 5 classroom. First of all, I will be very upfront and tell you that the project did not go the way we had envisioned. I fully admit that there were technical difficulties that could not be resolved in the moment; however, you know something still worked when at the end of the block the classroom teacher has a smile on her face and the students are chatting about the activity – in a good way; not complaining about what didn’t work, but rather what was really cool and engaging about it. I even had a student after school shout out to me as I was heading out the door: ‘Ms. Sanderson, that was such a fun activity today!’ And even more than the fun aspect, the content objective truly was met with this activity. Students thoroughly reviewed for their weather benchmark during the process. The perks: it was done in an active and game-like manner. It didn’t feel like a review to students at all. 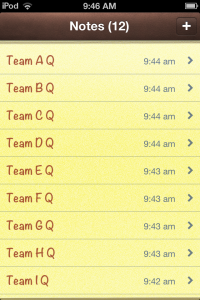 Armed with an iPod Touch, students in teams of two would start at a QR Code somewhere in the school building. They would scan the code and receive a weather question on the Touch’s screen. They would discuss and formulate an answer with their partner, and then use the built-in Notes app to jot down the answer. This answer would be emailed to the teacher from the Touch, and the teacher would respond via email back to the students. If an answer was correct, students would receive a clue to where the next QR Code could be found in the building. If an answer was incorrect, the students would be asked to try again. If after two tries, students were unsuccessful, the answer and the clue to move on to the next QR Code would be given by the teacher. Students would be given a time limit on when they had to be back to the classroom, finished or not. The classroom teacher during this activity was going to be at “mission control” in the classroom. She would be sitting at her computer fielding the emails and keeping track of student responses. On a spreadsheet, she would note what stations (questions) students had accomplished as well as what content they needed to make sure that they studied more. More adults would be needed, of course, since the students were out and about the school The instructional technology specialist (me) would float around assisting students as needed as well as any available teaching assistant. To make all this happen, a lot of preparation took place. The classroom teacher created review questions and used the QR Code Generator Tool (from Classtools.net) to turn them into QR Codes. The codes were mounted on construction paper. The classroom teacher also had to choose locations for these codes to be “hidden” throughout the building and then put them in place before the big hunt. Clues to the next QR Code location had to be crafted. To make the hunt more interesting (and to slow students down a little), the clues were designed as riddles. A map of the school had to copied for each pairing of students to help them as they deciphered the clues. The teacher also had to assign partnerships (pairing students of varying abilities together) and write on a “top secret” post-it note for each group where they would be starting. To make the “mission control”task of answering emails easier and faster for the teacher, several electronic files were crafted by the teacher to reference answers and copy & paste clues into the body of the email communications. The teacher made a chart/spreadsheet of the groups and stations to keep track of what questions (QR Code stations) students had completed. Likewise, notes regarding if students had to be given the answer could be recorded. This information would let the teacher as well as the students know what still need to be studied for the benchmark. Finally, the classroom teacher anticipated for some down time as students waited for the email communication. She made sure a weather word search was on each team’s clipboard. The instructional technology specialist had preparations, too. A direction sheet that explained the order and how to use the various apps to be successful during the hunt was created. Each iPod Touch had the Scan app loaded. Each iPod Touch was checked that its shared Gmail account was functioning. In order for the classroom teacher to know what group and question she was addressing in the email, a system for the subject line was established. 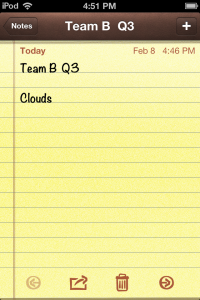 A Notes page was set up for each team on the devices. Because the Touch’s share the same Apple ID, the Notes pages are visible on all of the Touches. 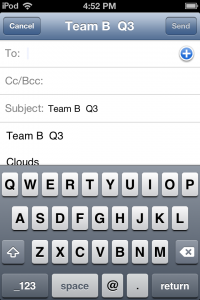 Having the pages preset would make it less confusing to students and help with the subject line system. Furthermore, the teacher’s name and email was added into Contacts on the devices to make emailing the answer more efficient and accurate. Because there are many new Airports (Wi-Fi spots) in the building with passwords, the iPods were taken out prior to the hunt and made sure that they all at network access. (Directions would be given about how to check and access Wi-Fi on the direction sheet just in case.) In an effort to micromanage, I even closed all other apps running on the devices prior to the Scavenger Hunt, thinking it would be easier for students to double click the Home Button to jump right into the apps they needed. After all of this work, the teacher and I were very excited to give this little review experiment a try. We even made a back up date in case the weather did not cooperate! On the day of the hunt, the teacher and I did a dry run during a planning period. Materials were put out for easy distribution. When the time came, I gave a 10-15 minute overview of expectations and walked students through how to read the direction sheet. Both of us reminded students about this being a privileged activity (walking around the school on your own), too. And then they were off and running. As I checked in with groups within the first five minutes, they were champs at scanning the codes, finding their Notes page and emailing an answer very quickly to the teacher. And then it happened, we had a glitch. 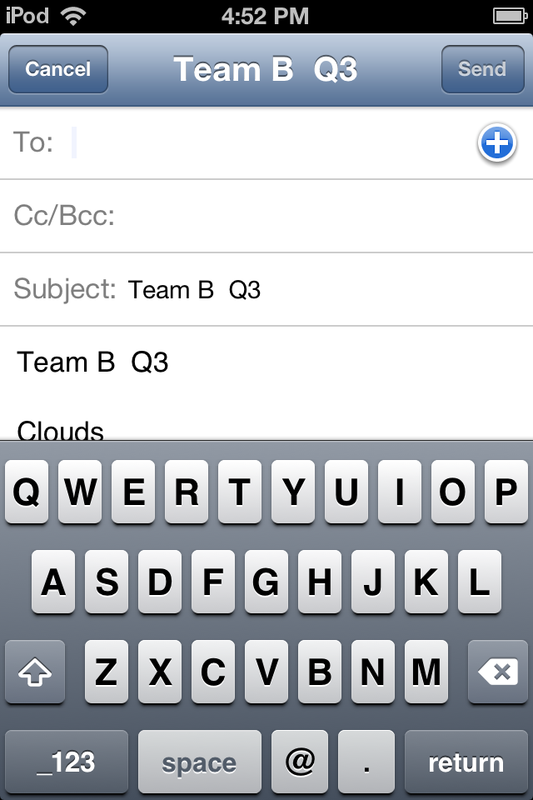 We discovered that the students could send out emails easily, but retrieving the replies was another story. The Touches were all giving the same error message that the username and password were wrong when the devices looked for new mail. Having the same email account was working against us. Students were not able to hear from the teacher if the answers were correct. Therefore, they couldn’t move forward because even if they were to write the answers down on the back of the word searches, the only way they would know the location for the next QR Code (question) was from the teacher via email. These clues were not anywhere else for them to discover independently. Realizing that the email solution was not a quick fix and not wanting to have the technology impede the purpose of the activity, students who were beginning to collect all around me and the other assisting adults were told that we were going to have to do it another way. Fortunately, some of adults that were floating around had been given a copy of the answers and the clues in case a team was stuck and needed a few hints. Now, students were instructed to check in with these teachers when they had an answer for a station. The assisting teachers would give feedback and read them the clue to move on. I then alerted the classroom teacher who was back at “mission control”. She had noticed that things had been a little quiet after the initial influx of emails. She printed out some more answers and clues sheets and joined us in the hallways. Some students continued to email the answers to the teacher as a record of their attempts, but they understood that they had to get feedback face-to-face. As stated earlier, in spite of this tech snafu, it all seemed to work out. I asked the teacher which way she preferred: sitting at her computer or floating around as the answer/clue supplier on the hunt. She said that she liked both ways. It was fun to be interacting with the students via email, but it also was nice to talk directly to them. The down side that I could see of having students do a face-to-face check in is that students had to travel around to find a teacher even though we were roaming around to find them. Often they may have noticed another QR Code as they looked for an adult, taking away from some of the mystery of where the codes were hidden. That night, from lessons learned, I created a unique Gmail account for each of the devices. I also decided that I didn’t need to micromanage the apps. Students found them fine. 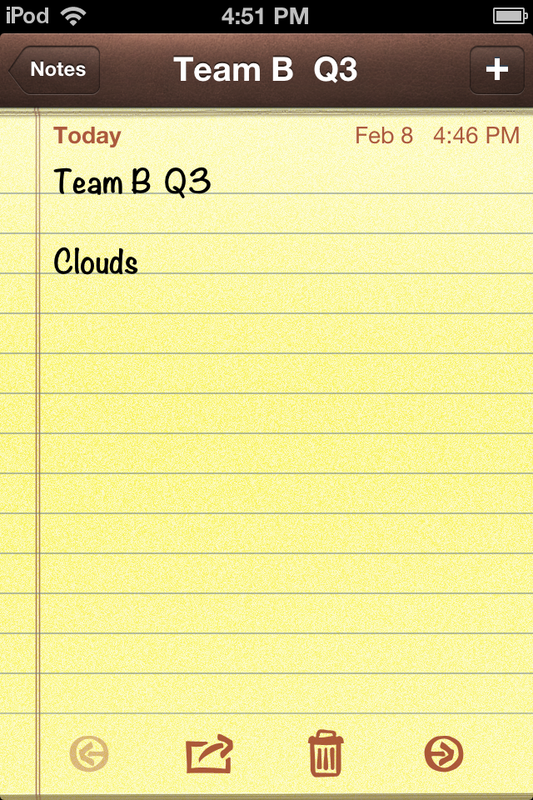 I, however, still would set up the Notes pages in the future as that seems like it was helpful. This experience is a good example of the good and bad of technology in a lesson. So much preparation and anticipation went into this activity, that if we had not been able to pull it off in the end, it would have felt like a major fail. For this reason, I can understand how teachers can become frustrated and unwilling to try new things when it comes to technology. I have written this post in hopes that others can learn from our trials and tribulations. Please feel free to use our materials and ideas, and any suggestions, feedback or your own recounts are welcome. I’d love to hear how you have made the activity your own and even better!